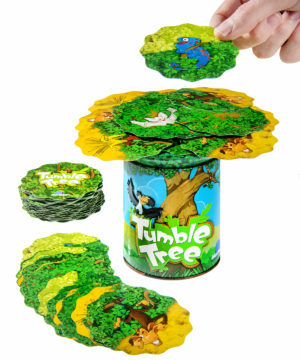 Tumble Tree Game: Stack your cards without toppling the pile! Stack your cards without toppling the pile! If a Tumble Tree falls in a forest, someone will be around to hear it—and they’ll also hear the laughter that follows! 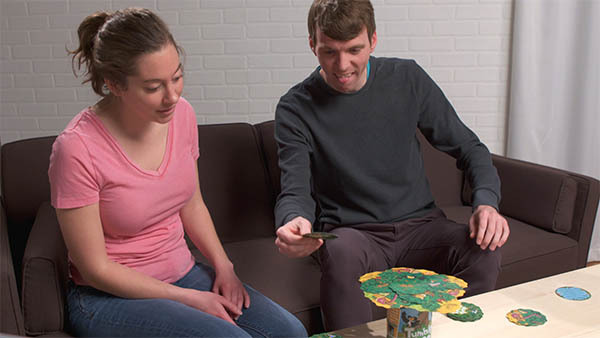 Gather your family to play this easy-to-learn card stacking game. The portable game’s storage tin doubles as the game board as you take turns piling cards on the tin’s wide lid. Each card’s jungle inspired illustration determines how you'll add it to the pile; this usually involves precariously balancing the card (which threatens to bring down the whole stack). Win the game by carefully adding your cards without toppling the tree. It’s like Jenga in the jungle that’ll have everyone laughing like a barrel of monkeys. 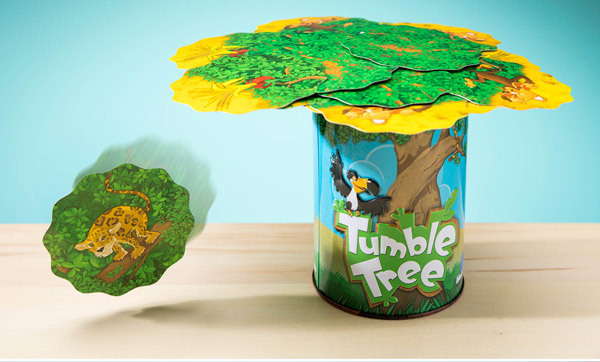 Tumble Tree is a delicate balancing game with a dash of raucous goofiness that’ll make you laugh like a monkey in a tree. The game’s storage tin acts as the trunk of a tree that players try to grow by stacking cards on its flat top. As the game progresses, the pile on top of the tin grows heavy, and each new card increases the risk of toppling. Carefully build your treehouse of cards and revel in the delightful deforestation that results. On each player’s turn, they draw cards from their individual drawing pile and lay them on top of the tree according to the rules on the card. While some cards let you place them wherever you want, others force you to toss, slam, and blindly drop the card and hope for the best. If your addition upsets the precarious pileup, you must collect all of the fallen cards into a penalty pile. 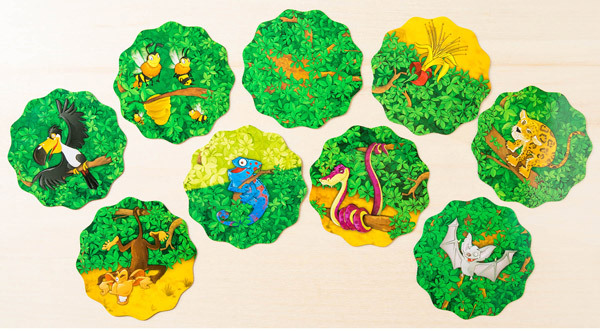 Win by having the fewest cards at the end of the game to be declared king of the jungle. Place your card on top of the pile and hope it doesn’t fall! Although the goal of Tumble Tree is to create a sprawling overhang, the game itself is quite self-contained. Since the game’s storage tin doubles as its playing area, it’s especially easy to take with you to a friend’s game night. The nine types of illustrated playing cards guarantee that each draw will bring a fun and quirky rule while the two reference cards help you keep it all straight. The game includes a storage tin and 108 cards. Question: Is it limited to just four players? 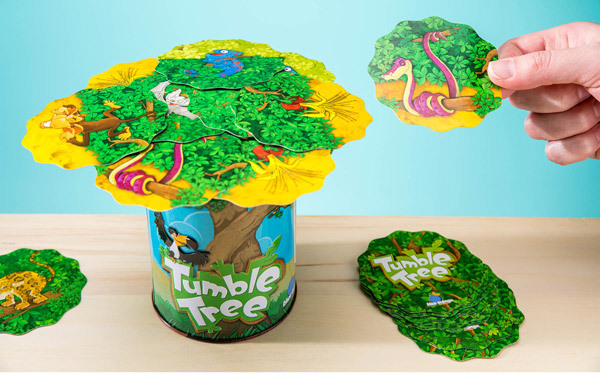 Answer: Tumble Tree is designed for optimal play with 2-4 players. You could certainly add more if you like, but each player will start with fewer cards. Question: How long does a game last? 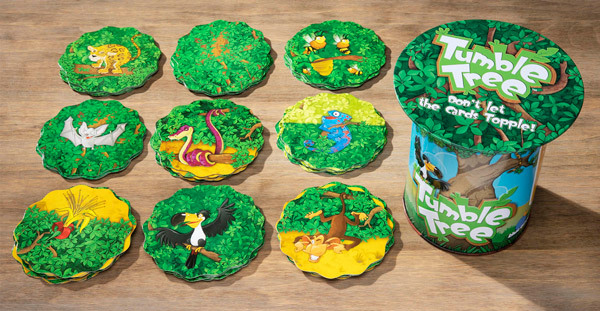 Answer: A typical game of Tumble Tree lasts about 10-15 minutes.